The southern province of Ba Ria-Vung Tau on February 14 handed over nine investment licences worth over 9.9 trillion VND (425.7 million USD) and nearly 163 million USD to investors. The most noteworthy projects licensed are the 115 million USD instant coffee production plant of Japan’s Marubeni Group; the 12.62 million USD liquefied natural gas (LNG) plant of PVGAZPROM Natural Gas for Vehicles, a joint Russian-Vietnamese company; and the 35 million USD cement additive production plant by CHC Vietnam. Other projects include the Da Bac 4 solar power plant, worth 1.09 trillion VND (46.87 million USD) of Dong A Chau Duc JSC, and the 175 billion VND (7.5 million USD) speedboat project linking Vung Tau city with Con Dao island of PQ Express JSC. The same day, the provincial People’s Committee supported plans to establish a high-tech industrial, urban, and service area with a total registered capital of 7.21 trillion VND (310.03 million USD). It also backed the expansion of the B1 Conac industrial park with an investment of over 1 trillion VND (43 million USD). 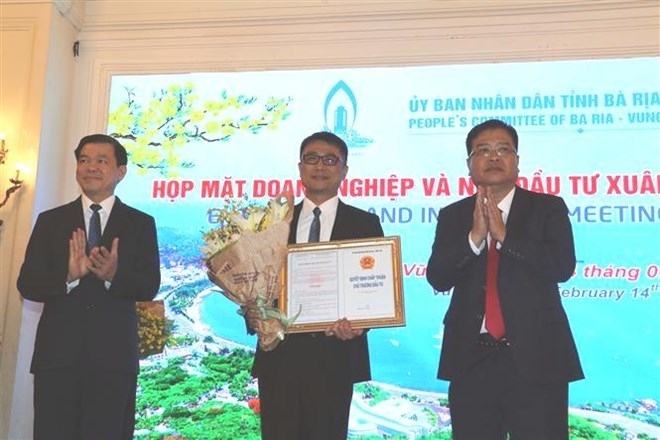 Nguyen Hong Linh, Secretary of the provincial Party Committee, said Ba Ria-Vung Tau will call for capable and experienced investors in major projects in 2019, focusing on the five pillars of industry, seaports, logistics for sea ports, tourism, and high-tech agriculture. The province will continue to accompany businesses and investors, reform administrative procedures, improve the local investment environment, and increase dialogues with investors and enterprises, said Nguyen Van Trinh, Chairman of the provincial People’s Committee. Statistics show that the province’s economy grew 7.2 percent in 2018, a record pace over the past eight years. During 2018, the locality attracted 44 foreign and 59 domestic projects with a combined investment amounting to about 1.9 billion USD and 18.76 trillion VND (806.68 million USD) respectively, ranking second nationwide in new FDI project attraction. The province has, to date, accommodated 351 valid FDI and 521 domestic projects, valued at 27.3 billion USD and 276 trillion VND (11.8 billion USD) respectively. On the occasion, firms based in Ba Ria-Vung Tau contributed over 7 billion VND (301,000 USD) to local social welfare activities.